Thank you for your enquiry, someone will be in touch soon. The Vent Axia Team. In-line back draught shutters manufactured in electro-zinc steel these units have a positive spring return mechanism. The springs are carefully selected for positive closure without undue pressure loss. 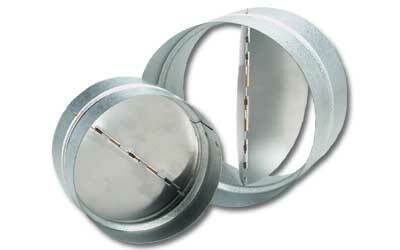 Diameters from 100 to 315mm. Also available in 400mm diameter to special request. Calculate estimated running costs for this product using the tool below. For average costs, leave the default values in place or enter your own figures in the boxes to recalculate. Where a product has multi speeds, a typical installation has been used for the below calculations. Company Number: 11352032. Registered Address: Fleming Way, Crawley, West Sussex RH10 9YX.